Yes, they really are easier on your hands! Kollage's square knitting needles are designed to be ergonomically suited to your hands, decreasing stress and strain for those who love to knit. The square shape also helps your stitches look straighter and more uniform. These double points are made out of a high grade aluminum in a lovely titanium color and have nice sharp tips for precision knitting. As an added bonus, these needles are 100% made in the USA! Knitter's Pride Zing Double Pointed Needles and ChiaoGoo Double Pointed Needles are both similar needles: 6" / 6.5", double point, and US 7 (4.5mm) US size. You may enjoy taking a look at the , and Lady Violet's Dinner Gauntlets kits all using Kollage Square Double Pointed Needles. 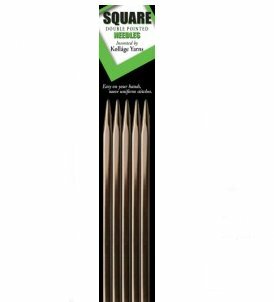 Knitter's Pride Nova Cubics Platina Double Point Needles From $7.07 to $10.10Select options on sale now!